A little female Ruby-throated hummingbird visits one of the blossoms on my Rose of Sharon hibiscus bush. Every day in August I see them buzzing about and enjoy watching them from my front porch. So of course, I had to paint one! 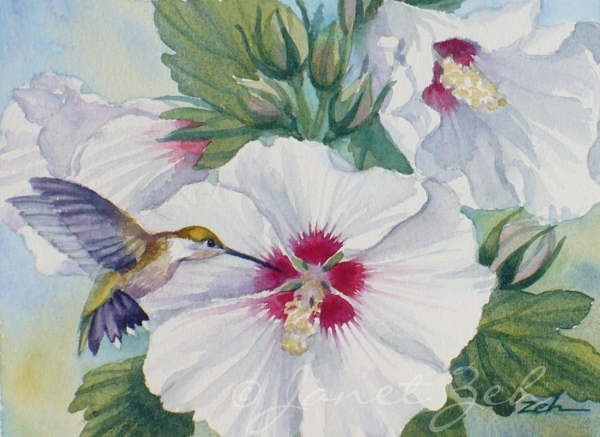 I've done many paintings of hummingbirds usually the male with its bright red throat, but the female is pretty too and I thought I'd give her some equal time. The original painting has been sold, but you can contact me if you'd like a print or a painting made just for you.